A strand of research, looking at buildings associated with the routes taken by the army of James IV on its way to and from the Battle of Flodden, came to focus largely on ecclesiastical buildings, largely because it was found that the majority of genuinely medieval buildings in the region are churches and monasteries, and it is inconceivable that such establishments, in particular monastic houses, would not have played a significant role at the time of the battle, and especially in its aftermath, when many wounded were trying to make their way home. In this regard there is a tradition that the nuns of Coldstream priory carried wounded Scottish soldiers back to Coldstream for treatment and it is also of note, in this context, that King James’ cousin, John Stewart Duke of Albany, who became governor of Scotland after Flodden on behalf of the young James V, ‘marched to Eccles a monastery about six miles distant’ (Buchanan, History 2: 287-8) following the failure of his campaign late in 1523 to take the newly fortified stronghold of Wark Castle. At Abbey St Bathans, site of a former late medieval Cistercian nunnery, test pitting revealed settlement remains immediately east of the current church and churchyard, while the site of the purportedly earlier chapel of St Bathan to the south-east, was excavated in order to reveal and record structural remains last seen, and perfunctorily recorded, in the 1860s. In addition, two days in May 2016 were spent recording the complex structural remains of the multi-phase medieval church of Preston. Finally, a visit to a private burial ground in the grounds of Wedderburn Castle revealed the head and base of a medieval cross reputedly linked to members of the Hume family killed at Flodden and in a preceding campaign of 1497, but subsequent excavations, led by John Hume-Robertson, failed to find any evidence of burials on the site. 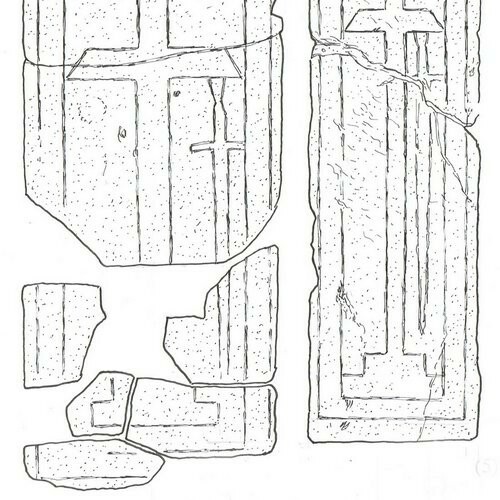 In addition to surviving medieval and early postmedieval church remains, a possible tangible link to the battle was found in a series of grave slabs, several at Coldingham Priory and single examples at Bassendean, Edrom, Greenlaw and Longformacus, which are probably of early 16th century date and have a distinctive cross motif, identified in a 1911 Berwickshire Naturalists Club article as a heraldic ‘cross of pain’. In addition, all have marginal panels as if for an inscription, although there is no sign of any ever being carved. Crosshall Cross near EcclesA link to Flodden cannot be ruled out since, stylistically these are slabs of a type which would normally cover high-status burials and could well be of the early 16th century, but some look to have been produced in a hurry and never finished, tenuously suggesting a possible link with the aftermath of battle. 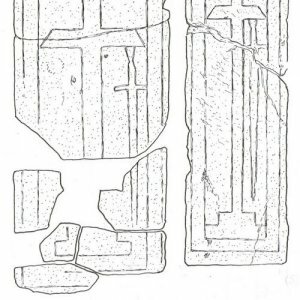 Some features of the incised crosses on the Crosshall Cross also appear later medieval (15th or early 16th century) and may be secondary, with triangular terminals similar to some at Coldingham. The tides of history have erased the medieval ecclesiastical landscape of Scotland far more thoroughly than that of England, where a parish church dating back the better part of a thousand years is still present in most villages. In the whole of the country of Scotland less medieval churches - around 50 in all - remain in use than in any one of the English border counties. Virtually all English churches remained in use after the Reformation, albeit with a reordering of their internal fittings and furnishings; Victorian restoration - which often entailed a return to an idealised medieval arrangement - has been the main threat to their fabrics. Even in industrialised areas such as West Yorkshire only a handful of churches do not retain something of their medieval predecessors. Despite these conversions and rebuildings, a great many old churches were abandoned and replaced by new buildings on new sites, often closer to the main centres of population. Church buildings were abandoned far more readily than burial grounds, which would remain in use for many generations after the old church was demolished or left to crumble. Many abandoned churches were simply converted into burial aisles or enclosures by local families; Preston near Duns is a good example. With the rise of ‘resurrectionism’ in the late 18th and early 19th centuries, with the recently-deceased being illegally exhumed to cater for the demand of new medical schools, mort houses (where a corpse could be kept under lock and key until no longer desirable) and watch houses (to house guards) were often built into ruins. Where medieval fabric does survive in a church that is still in use, it can be difficult to identify as all original architectural features may have been lost. An unusually elongate shape may indicate Pre-Reformation origins, as will a nave-and-chancel plan. 19th and early 20th century restorations sometimes saw a church returned to its medieval form, and might well include the reclamation of a chancel adapted or rebuilt as a burial vault. It is possible that medieval fabric survives unrecognised in quite a number of churches, especially those in which wall surfaces are obscured by render and plaster. Descriptions of the majority of ecclesiastical sites visited as part of survey work associated with the Roads to Flodden project can be found on the Flodden 1513 website. These did not include all of the medieval ecclesiastical sites in the Borders region but focused on those considered most likely to have a connection with the events preceding and following the Flodden campaign. In addition to the monastic sites of Abbey St Bathans, Coldingham, Dryburgh, Eccles, Jedburgh, Kelso and Melrose, the sites of two memorial crosses, at Crosshall and Wedderburn, and the following church sites were visited and investigated: Ancrum, Ayton, Bassendean, Benrig, Bunkle, Chirnside, Cockburnspath, Cranshaws, Crosshall Cross, Eckford, Edrom, Ellem, Fogo, Greenlaw, Hume, Kirk Yetholm, Ladykirk, Legerwood, Lempitlaw, Lennel, Linton, Longformacus, Maxto, Minto, Morebattle, Mow (or Molle), Nenthorn, Nisbet, Old Cambus (or Aldcambus), Oxnam, Polwarth, Preston, Halterburn (site of St Ethelreda’s Chapel), Simprim, Smailholm and Wedderburn (Cross site). Following are descriptions of sites where more detailed recording and excavation work took place. Abbey St Bathans - excavations south of the kirkNow privately owned and no longer a place of worship – leaving Coldingham as the only former priory church in the Borders to remain in use for worship - this was originally the church of a small Cistercian nunnery, in plan a simple rectangle remodelled in the 18th century (when its western third was removed) and again in the mid-19th when the small north-east tower and south-west porch were added. The thick east wall is medieval, with a two-light window with mid-wall tracery, and inside a 19th century recess containing a fine effigy said to be a prioress, of 15th century date, which had been found re-used in another wall. The east gable has an interesting shaped footstone at its south end, and the jambs of blocked doors are visible below 19th century windows near the east end of the south wall and in the centre of the north wall. Outside the church the lower courses of the north wall of the demolished western part survive for around 5 m, visible at the foot of the external face of the churchyard wall. There is also toothing for a continuing metre-thick wall at the north end of the east wall. The cloister is thought to have been on the north, where there is an artificial raised platform between the church and the Whiteadder Water. Abbey St Bathans - domestic remains exposed south of the kirkExcavations in May 2016 focussed initially on the pasture field on the east side of the churchyard wall, since this was the only piece of open ground adjacent to the kirk where permission was granted for excavation. Several trenches here produced little of interest, although metal-detecting in this area produced numerous finds, including two spectacle buckles in cast copper alloy dating to c.1500 -1650, a lead disc with reverse impression of a Mary half-crown and four Charles I copper ha’pennies of mid-17th century date. Excavation of a small trench immediately adjacent to the field boundary on a slight ridge which continued westwards into the cemetery, running south of the line of the kirk, was more productive, however, revealing part of a cobbled surface, a large post-hole and tumbled building remains amongst which were large fragments of late medieval pottery, including cooking jars. This suggests that there was a significant focus of domestic activity in a building, or buildings south-east of the kirk. Whether these were directly linked to the Cistercian priory or part of an adjacent village is open to discussion and should be the subject of future investigation, as should the presumed cloister area on the north side. The location of a chapel dedicated to the 7th century St Ethelreda, who spent a year as a novice at Coldingham Priory between 671-672 AD, has long been debated and several putative sites suggested, most recently in a survey of sources carried out with the benefit of detailed knowledge of the local landscape by Yetholm resident and Flodden volunteer, Tom Broad. Tom Broad suggests, in his exhaustive examination of the sources (A Halter Burn Chapel: the search for St Ethelreda’s, Berwick upon Tweed: BAS) that the chapel may have been built as a place where the faithful could rest and pray on their way to Lindisfarne, with its origins in the shelters made by people receiving Cuthbert’s ministrations in remote and mountainous areas. The sparse references to the chapel, however, are all in later medieval and post-medieval documents, the first known being in a land grant of c. 1230 described in the Kelso Cartular. Halter Burn - Linear earthwork and mound on the flood plainThe other, later references do not refer to St Ethelreda’s chapel but to its location: thus, a Helter Chapel is included in Bowes survey of 1583 and Johnson and Goodwin’s survey of the Border Line in 1604 and a Shotten Chapel (apparently then in England, but perhaps the same site) is referred to in communications between Lord Dacre and the Earl of Surrey in 1523. Four sites were examined as part of the current survey, including the site at the foot of Shotton Hill, on the English side of the Border, currently recognised by the Ordnance Survey and another, at the confluence of Humbleton Sike with the Halter Burn which had been recognised until the 1930s. Principal focus was upon the latter which, on the basis of topography and, in particular, the 1604 survey, seemed most plausible. While the latter produced no finds of significance, the four pits excavated on the visible earthworks all produced finds of great interest. The linear earthwork, examined in two places, proved to be the remains of a drystone wall, lost to a palaeo-channel at its south end but surviving well at foundation level to the north where it was some 0.8 m wide and associated with sparse medieval pottery. The earthwork mound on the west side of the linear feature, closer to the Halter Burn, was investigated by means of two pits, both extended to 2 m in length. Made deposits were found to survive in each pit to over a metre in depth while abundant rubble suggested the remains of a building, confirmed in the most northerly test-pit where the remains of a wall were uncovered, along with 20 sherds of largely unabraded medieval pottery. No other finds of note were made, but these are sufficient to suggest the domestic occupation of a medieval building on this site. Given the position given for St Ethelreda’s chapel in the 1604 survey it is reasonable to suggest that the remains discovered are those of the chapel or, perhaps more likely given the amount of pottery recovered, those of an ancillary building, perhaps a rectory or rest house. In view of these findings it is concluded that this site certainly merits more investigation by excavation.